To develop the human resource in the savings and credit cooperatives for better competence, capability, skill and attitude in the operation and management of the savings and credit cooperatives efficiently and effectively. 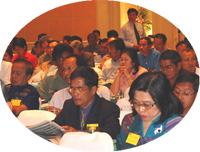 Therefore the service on trainings and seminars in various courses have been conducted throughout the year. In addition , the lecturers are also provided to the member cooperatives to arrange the trainings and seminars, training of local lecturers, financial support to conduct seminar for small cooperatives, savings cooperatives youth camp for nature study and environment conservation.